Tetsushi Higashino (JP) and Jean-Charles de Quillacq (FR). On Friday 23 March both Het Wilde Weten and Duende will open their doors for the presentations of their current artists-in-residence. The evening will start at 6 PM at Het Wilde Weten with dinner and a campfire. At 9 PM dessert is served in Duende and the opening will continue with a DJ. You are welcome to this combined opening of both presentations! In July 2011 the cabin residence Hellebou, located in the outskirts of Telemark, Norway, was met with a sudden stream of applications from Rotterdam, The Netherlands. It was decided to invite a group of artists from this city, to explore what would arise in the meeting between these different environments. In the fall of 2011 five visual artists from Rotterdam spent time in the cabin. In turn Hellebou´s hosts travelled to Rotterdam in January 2012, for a three month stay in the artist residency at Het Wilde Weten. Their stay will culminate in the exhibition Here and There; A bond tied directly between Telemark and Rotterdam. The exhibition presents works produced in Hellebou by Marijke Appelman, Joshua Thies, Dico Kruijsse, Inge Aanstoot, Johanne Birkeland and Ellen Henriette Suhrke. Material from Hellebou has been reinterpreted or reenacted for this occasion. Hellebu is a log cabin located in Telemark, Norway. 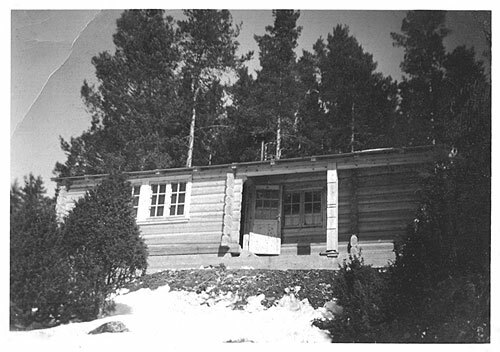 The project of Hellebou was founded by Johanne Birkeland and Ellen Henriette Suhrke after a weekend spent in the cabin. At that point the cabin was functioning as a storage space. With a desire to activate and make use of the facilities Hellebu was turned into a guest house. For the past three years they have maintained an all-year artist residency, and encouraged visitors to explore the cabin and its surrounding lakes, mountains and forest trails. The artworks produced end up in an annual publication that takes the form of magazines and vinylrecords. Hellebou presents fine arts, literature and sound with an emphasis on young, active artists.